- Others: PSP, GoPro, e-reader, MP3 Players, Nintendo Switch, Bluetooth Speakers, Bluetooth Headphones, tablet and smart phones etc. Dual output to charge two devices simultaneously. Auto detects your device to deliver its fastest possible charge speed up to 2.1A. DC 5V/2A high-speed input is twice as fast as normal DC 5V/1A input - a full recharge only takes 6 hours with DC 5V/2A charger. We strongly recommend using your original cable, a third-party certified cable (such as MFI) or the attached Yoobao brand micro usb cable. 10000mAh Phone charger - Enough power on the GO, able to give 3.3 solid charges to an iPhone 8, or 2 full charges to a Samsung Galaxy S8, or 1.3 charge to an iPad mini 4. Palm-Sized - Compact size and lightweight makes it easy to carry and fits easily into pocket. Dual USB Output - Allows for simultaneous charging of your iPad, iPhone, Android, and more devices at high speed. 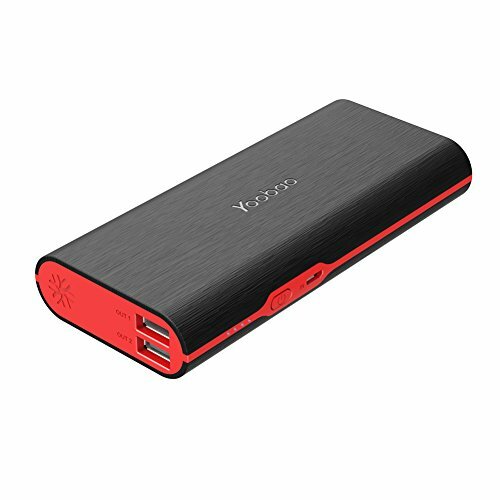 What You Get - 1x Yoobao M10 10000mAh Power Bank, 1x Micro USB Cable (PS: Not included Apple Lightning and USB-C cable, Apple and USB-C devices need to be charged by your own cable. ), 1x User Manual, 18-Month Warranty & friendly customer service.